Southern Kurdistan, also known as Iraqi Kurdistan, is a world wide recognized autonomous region in northern Iraq. The region have been stabilized since 1992 and became de facto independent until the recognition of Iraqi constitution in 2005. It is de jure part of Iraq. Since then it has been a federally recognized area, and also has been the only recognized Kurdish political entity in the world. Kurdistan Autonomous Region borders Iranian occupied Kurdistan to the east, Turkish occupied Kurdistan to the north and the rest of Iraq to the south. Its western neighbour is Rojava, a de facto autonomus Kurdish region in Syria. Erbil (Kurdish: Hewlêr) is the capital of Southern Kurdistan. South Kurdistan’s borders are disputed as a result of Arabization campaign of the Iraqi Government. Kurds are losing their claims on their territories because of ongoing Arabization Campaign. The eastern part of Iraqi Kurdistan has been homogeneously Kurdish throughout the history. 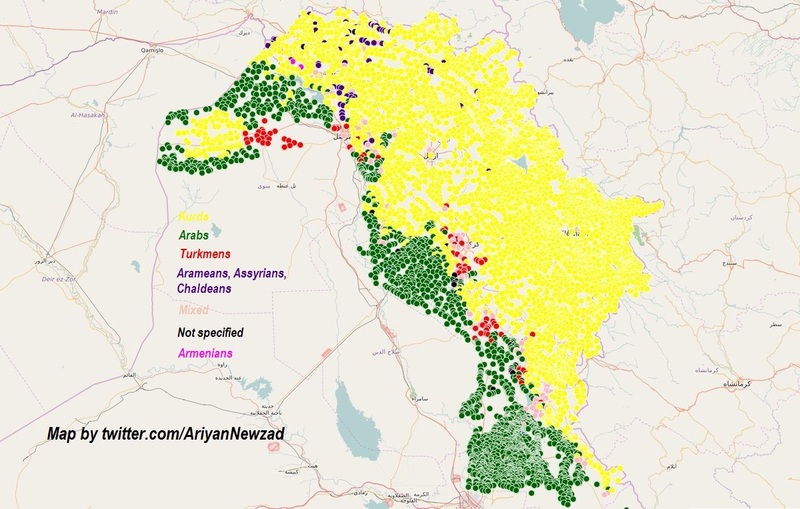 Kurds make up the entire populations in Sulaymaniyah (Ku: Slemani) and Halabja provinces. Khanaqin (Xanaqin) district of Diyala province is a pure Kurdish settlement as well. The southern and western parts of South Kurdistan is diverse because of Iraq’s forceful Arabization policy and Christian migration to the region. 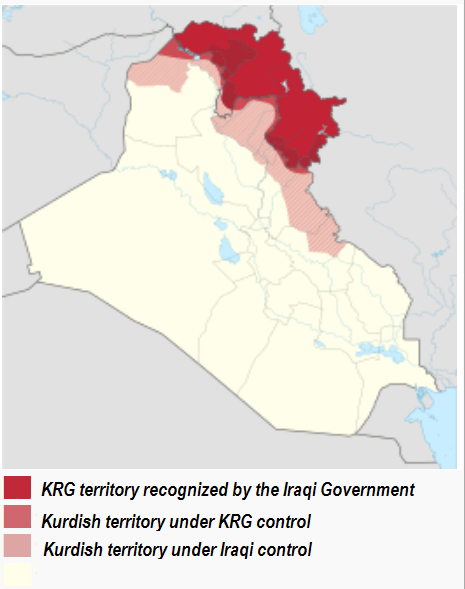 KRG’s population is predominantly Kurdish. There are also Chaldean, Assyrian, Turkmen, Armenian, Roma and Caucasian minorities. In addition to the established minorities, there are Arab immigrants and IDPs. In last several years, Arabs outnumbered the other minorities. The official languages of Iraqi Kurdistan are Kurdish and Arabic. Syriac-Aramaic and Turkish dialects spoken by Turkmen have the status of minority language. Since the fall of Saddam Hussein in 2003, Southern Kurdistan has seen enormous migration from all parts of Iraq (mainly Sunni Arabs and Christians) , and additionally refugee flood from Syria. Even Palestinians sought refuge in the KRG. As a result of the stability and safety, Kurdistan has been safe haven for non-Kurds and non-Iraqis. Since the British Mandate, Arabization has been Iraq’s main policy. As part of the Arabization campaign, Kurds suffered ethnic cleansings, massacres, chemical attacks and genocides in different periods of time. Southern Kurdistan is religiously the most diverse part of Greater Kurdistan. In addition to Muslim (mostly Sunni) majority, there are Christians, Yezidis, Yarsanis (including Shabaks and Kakais), Zoroastrians and Jews. In comparison with the rest of Iraq and neighboring countries, Kurdistan has much more religous tolerance and freedom. Indian workers in Erbil,Kurdistan practising Hinduism. Photo by Rudaw. The Kurdish Autonomous Region is divided at the provincial level that is called Parezga in Kurdish (Arabic: muhafazah). At lower level, the provinces are divided into regions (Arabic: qazaa), even smaller regions at city level are called nahiya. Since 1992, the Kurdish government has governed two provinces as a whole: Duhok and Suleimaniya. And Erbil province without Makhmour. Plus, in 2014 the province of Halabja was established and recognized by KRG but still unrecognized by the Iraqi government. Kirkuk province, Makhmour, Tuz Khurmatu, parts of Ninawa province and Feyli Kurdish areas (Eastern Diyala and Northeastern corner of Wasit) became disputed because of Arabization campaigns by Iraq. Despite the wars and shortages in recent years, the economy of Iraqi Kurdistan is still many times more stable and more modern in comparison with that of the rest of Iraq. For example, the presence of foreign companies and investors is relatively higher here, mainly due to the secular atmosphere. Large modernization projects have been started in large cities (mainly Duhok, Erbil and Sulaymaniyah) with a view to the future, mostly with the help of foreign investors. Some of these projects have already been delivered. Iraqi Kurdistan has announced a unified investment law. Almost all tourism to Iraq is to Iraqi Kurdistan. South Kurdistan’s economy is highly dependent on oil. Apart from oil industry, there is an inflation of constructions. Turkey is the biggest economic partner of KRG.